The Borough Road Gallery is a home for visual art and is a unique part of the University's heritage. Opened in 2012, the Borough Road Gallery contains valuable and significant works of Post War British Art in public collection, produced by the celebrated artist and teacher David Bomberg (1890-1957). The Gallery, located in LSBU's Borough Road building, was financed by a grant from the Heritage Lottery Fund. 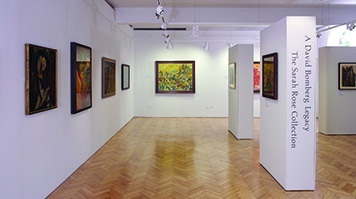 The grant enabled LSBU to build a new gallery dedicated to exhibiting work from the Bomberg collection, and to carry out a related programme of exhibitions, events and education activities. The Gallery provides a window into the University for the public as well as a cultural hub for the university community offering staff and students a programme of engagement in the understanding and enjoyment of the visual arts. For many of our students it will create the start of a lifelong love of the visual art. It is a hub for many of our BA (Hons) Arts and Festival Management students and also supports our PhD research studentships focused upon curation, performance and media exhibition. Browse the Borough Road Gallery website for information on forthcoming exhibitions and events. David Bomberg is considered one of the most significant British artists of the twentieth century. He taught at LSBU (formerly Borough Polytechnic) after the Second World War. The collection on show has been built up over 30 years by Sarah Rose, an independent collector whose aim is to "draw much needed attention" to the teachings of Bomberg, and to artists who worked closely with him. In 2008 she placed the collection in Trust at LSBU. Commenting on the artwork, LSBU's Professor Andrew Dewdney says: "The collection demonstrates David Bomberg's approach to painting and his commitment as a teacher, as well as the unique vision of the single collector Sarah Rose. The gallery and its educational projects is now making this collection of post-war British figurative art public for the first time." When LSBU student Mark Smith was at the end of his second year, the gallery was due to open. At that time the gallery's curator spoke to his course and offered the opportunity to do a two-month placement at the gallery. Mark seized the opportunity and began his placement with a project to arrange a private view for the gallery's opening night. The experience and the degree to which Mark was trusted while working with the gallery means that he now feels increasingly confident of securing an exciting relevant position now he has graduated with a first-class degree. Read Mark's story detailing his work experience at the Borough Road Gallery.